The Matheson Law Office participates in the Advancing the Heart golf tournament at Eagle Ridge Golf Club. The event was put on by Top Shelf Co-Ed Hockey team, which Attorney Moseley Matheson plays for. The Advancing the Heart Golf tournament turned out to be a great success giving that it raised a total of $10,800 in only its first year. On September 7, 2013, the Matheson Law Office, a Wake County DWI Law Office in downtown Raleigh, got dressed to the nines to participate in the First Annual Top Shelf Hockey Team Charity Golf Tournament. 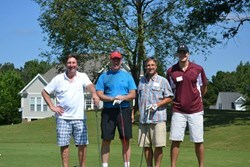 The event is hosted by a local hockey team at Eagle Ridge Golf Club in Raleigh, North Carolina. It was a beautiful summer day out there on the course and everyone was in high spirits and sported jovial attitudes preparing to have a good time for the sake of a great cause. Attorney Matheson is a member of the hosting hockey team, Top Shelf Hockey co-ed League, where he functions as the team's Center, an offensive position in charge of commanding and setting up plays. The firm's paralegal, who got his certificate from Duke University, Cameron Hardesty, served as the team's representative out on the fairways as him and his team played best ball to help get the best possible score. While the ending score was likely not up to par, everyone had a great time out there supporting a good cause and mingling with other Raleigh businesses and individuals in the community. The Top Shelf Hockey Team got together with the Advancing the Heart Foundation to host this amazing tournament with the goal of benefiting one of their own teammates suffering from a heart condition, in addition to all those in the community who may also be struggling with similar health issues. However, the day not only included golf but also showcased several hockey and golf themed activities for those were not so inclined to hit the greens. The tournament offered sixty different prizes and give-aways' that ranged from gift cards for local restaurants and jewelry stores, to the coveted Carolina Hurricane hockey tickets. The Advancing the Heart golf tournament turned out to be a great success giving that it raised a total of $10,800 in only its first year. "As a professional in the community I like to remain connected to my client basis and involve myself and my business in as many community events as possible. When I got news about this tournament being hosted through my hockey team, I jumped at the opportunity to benefit this foundation and to help sponsor this event, " said Raleigh Traffic Attorney, Moseley Matheson. The Matheson Law Office also contributed to the S.W.A.G. (Stuff We All Get) bags that were distributed to all those who participated in the tournament. This Raleigh Criminal Law Office designed coozies with its logo and business phone line printed on all three sides to distribute to all the guests who attended. They were also given out to friends and family of the firm's employees. All in all, the event turned out to be a huge success and all those who teed up for a good cause had a blast. The Matheson Law Office looks forward to participating in future events of this nature and will hopefully see all you next time at the second annual Advancing the Heart golf fundraiser.